One hundred and seventy one delegates assembled for the day’s business and the minutes from Thursday the 27th of August were read and accepted. The session accepted the four delegates from the Philippine Union Conference who arrived late due to delays in obtaining their visas. 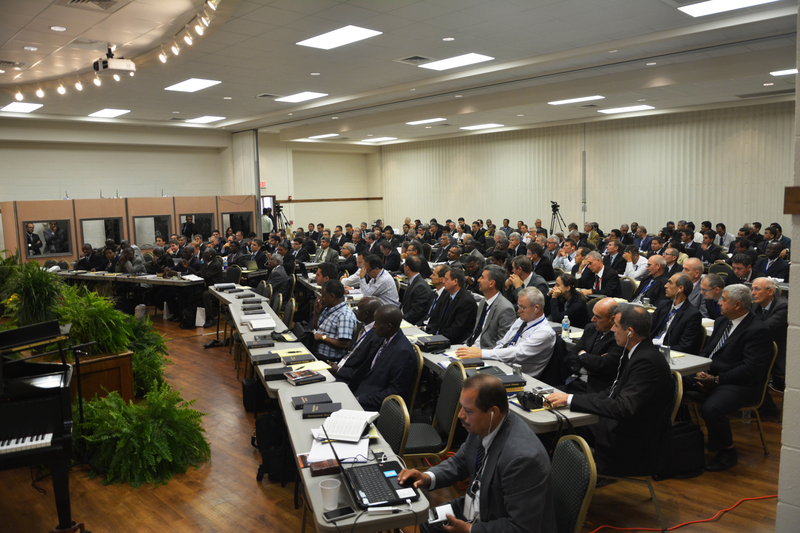 The first order of regular business was the discussion of the proposal of the doctrinal committee concerning the placement of the Seventh Day Adventist Reform Movement within the prophecy of the seven churches. After nine delegates spoke in regard to the motion the proposed statement was put to the floor for vote. An overwhelming majority of the session approved the following understanding of the question. 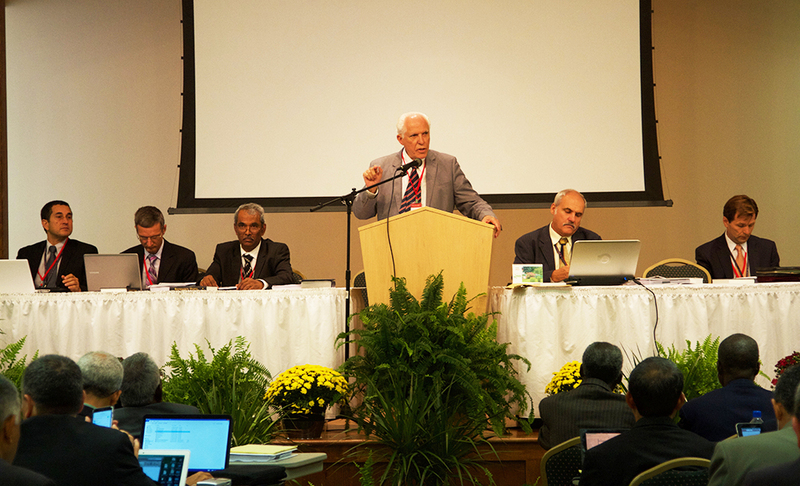 WHEREAS the issue of the placement of the Reform Movement within the prophecy of the seven churches was discussed by the General Conference Delegation Session (#52/2003) and was passed to the Working Doctrinal Committee, it was RESOLVED, that we acknowledge that the prophecy of the seven churches represent Christ’s church living in different periods of the Christian era, and that the Reform Movement, as the remnant church of Christ, is living within the period of Laodicea. The counsel of the Faithful Witness applies to each individual who desires salvation. It is our duty to accept this message personally and it is our mission to preach it to the whole world. Those who overcome during the Laodicean period will be granted to sit with Christ in His throne. It was FURTHER RESOLVED, that there is a difference between a person or denomination living in the last period of the New Testament church who have a tendency to fall into the condition described in the message to the Laodiceans receiving the message of warning and hope, and between those who actually come to the point of being spewed out. The missionary outreach programs or other religious exercises of an individual or denomination that is spewed out of the mouth of Christ are not accepted before God. “The names of the seven churches are symbolic of the church in different periods of the Christian Era. The number 7 indicates completeness, and is symbolic of the fact that the messages extend to the end of time, while the symbols used reveal the condition of the church at different periods in the history of the world.”—The Acts of the Apostles, p. 585; Testimonies, vol. 6, p. 77. After this the doctrinal agenda point on Euthanasia was considered by the session. A small amendment was made for clarification and the following position statement was adopted. WHEREAS God is the Life giver, and it is not the right of anyone to take human life, it was RESOLVED, that the practice of any human being intentionally ending a human life in order to relieve pain or suffering (euthanasia), is contrary to God’s will (Exodus 20:13). As Christians, we are not to request or consent to euthanasia nor should we be involved in the so-called mercy killing of another human being. It was FURTHER RESOLVED, that we believe that every human being has a personal human right to either choose or refuse medical treatment for any ailment, including terminal illness. The day’s proceedings concluded with the election of the President. The nominating committee after much prayer and consideration informed the session that they had nominated three candidates for the office of President. 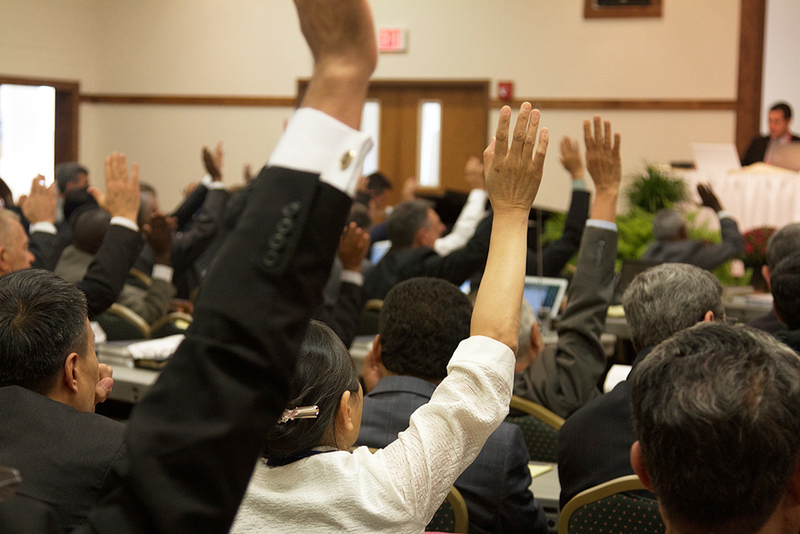 After one round of voting Br Davi Paes Silva was elected as President of the General Conference of the Seventh Day Adventist Reform Movement. Br Silva thanked the session for their vote of confidence in him and shared a short message of exhortation. Dear Brethren, I am very thankful to the Lord because we see that the Holy Spirit is working in the session and I am conscious, that we have a big task before us, and that by ourselves we can do nothing. I understand that those who voted made a commitment to support us in the work. We have no idea how to work by ourselves with our small team, but we depend first on God’s grace. We depend on the baptism of the Holy Spirit. As we travel around the world, we see that we have much to do. We have many problems to solve. But if we get closer to the Lord, if we make a complete surrender of our life to Him, if we keep a connection with Him the whole time, for sure God’s people will be victorious very soon. Brethren, when we think that the message of the Seventh Day Adventist Church started in 1844, how many years have passed already? When we consider 1888, more than 120 years (have passed) and we are still in this wilderness. The Reform Movement started in 1914, more than 100 years (ago). I think, brethren, we have no reason to manifest a kind of triumphant idea – we have no reason. I think that it is time to seek the Lord. We should recognize our weakness. We should recognize our dependency, and we should surrender ourselves completely to the Lord. Otherwise, brethren, we don’t know how many years we will still walk in this wilderness. I don’t know, but we need to make a decision — not a resolution — but we need to decide by ourselves here, to seek the Lord with our hearts. Our connection in our life should include all the departments in our life. A question, brethren: Are we walking in the light that we know? Brethren, what is the meaning of this, having the father’s name and Christ’s name in our foreheads? What is the meaning? We have his character in our life. His character is impressed in our life. Verse four says, “These are they which were not defiled with women,” which means they kept themselves pure – these people have a pure doctrine. They follow the Lamb wherever He goes. The Spirit of Prophecy says if you want to follow the Lamb to Mount Zion we need to follow Him today. It is not enough, brethren, to dream about salvation. Salvation depends on a vital connection with the Lord the whole time, and verse 5 says, no lie was found in their mouth, they are blameless. Then, brethren, we have a mission that is far beyond our power; we depend on the Holy Spirit individually and as a church. We need to be baptized by the Holy Spirit individually and as a church to fulfill the Word. Brethren, we see here two great powers. For instance the Bible talks about Babylon. Babylon controls the world. The angel of Revelation 18 needs to face Babylon. Compared with the denominations of the world we are just a very small number. How can we do this ourselves? Dear Brethren, we have a great responsibility before the Lord. Let us seek the Lord with all our hearts. I count on your prayers in my behalf and on the behalf of my team that will be chosen later. I would like to appeal to you, please, brethren, let’s take seriously our calling. Let us struggle with the Lord as Jacob, so that our name can be changed to “Israel”, an “overcomer”. I have a question for you, how many of you are willing to pray for us? Thank you very much, brethren.